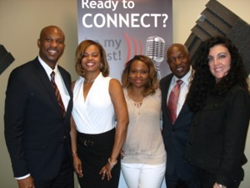 Business RadioX®'s Business Leaders of Today Spotlights Dr. Heavenly Kimes, Gregory Levett Sr. and Gregory Levett Jr.
Business Leaders of Today features owners of Heavenly Dental Associates and Gregory B. Levett & Sons Funeral Home on how to successfully run a small business. Our goal is to help everyone who dreams of owning a business. Dr. Heavenly Kimes of Heavenly Dental Associates appeared on the April 25, 2014 episode of Business Leaders of Today alongside Gregory Levett Sr. and Gregory Levett Jr. of Gregory B. Levett & Sons Funeral Home. Business Leaders of Today is co-hosted by Tess Turrin and Angel Nowlin. For over twelve years, Dr. Heavenly Kimes has successfully owned and operated multi-million dollar businesses. She believes that success starts with the proper mindset. Kimes was interviewed not only about Heavenly Dental Associates but one of her newer businesses—Dr. Heavenly University. Through Dr. Heavenly University, Kimes designs seminars for people who aspire to own their own businesses but may not have enough knowledge of the business world. Also on the show were successful business owners Gregory Levett Sr. and Gregory Levett Jr. of Gregory B. Levett & Sons Funeral Home. Nationally recognized as the top rated funeral home in Georgia, Gregory B. Levett & Sons Funeral Home is dedicated to excellence and providing reliable care and services. On top of funeral services offered, counseling services are also available. To learn more about these featured guests, listen to this interview in its entirety on Business Leaders of Today. Business Leaders of Today is hosted by Tess Turrin with basiQa and Angel Nowlin with Nationwide. Each week they give the best business leaders of today a forum to feature themselves and their companies to discuss different topics that pertain to their industry. Listeners have a unique opportunity to pick up various innovative industry tips, expert advice, and insider trends from the brightest and sharpest business leaders out there today. Business Leaders of Today airs on Fridays at 11:30am EST.